Tegucigalpa (Agenzia Fides) - Today is a crucial date for thousands of Hondurans who have been granted the State of Temporary Protection (TPS): Donald Trump's government must in fact communicate its decision during the day whether to prolong or cancel the program, which protects from expulsion and grants a temporary work permit to about 56,000 undocumented migrants from this Central American country who have been in the United States for nearly two decades. The TPS was granted to the Hondurans in January 1999 during the government of the then President Bill Clinton as a humanitarian response after the passage of Hurricane Mitch along the Central American coasts, which had left a trail of death on the Atlantic coast of Honduras and Nicaragua. This status expired on 5 January 2018 and, although a further six months were granted, until 5 July, the US authorities must rule 60 days before, ie today. Currently, of the three Central American countries - El Salvador, Nicaragua and Honduras - only Honduras still maintains such permission. Therefore those who do not regularize their situation between January (Nicaragua) and September (El Salvador) 2019, will have to leave the country. A decision that has been repeatedly condemned by the Bishops of the United States and El Salvador (see Fides 30/01/2018), who have visited the United States several times to meet the members of the Congress and to try and find a solution for the almost 200 thousand Salvadorians covered by the TPS (see Fides 12/04/2018). Last October, Mgr. Joe S. Vásquez, Bishop of Austin, Texas, and President of the Episcopal Commission for Migration of the United States Conference of Catholic Bishops (USCCB), presented a report on the issue by his Commission, urging everyone to address "their thoughts and their prayers to the people of El Salvador and Honduras, in particular to the recipients of the TPS". 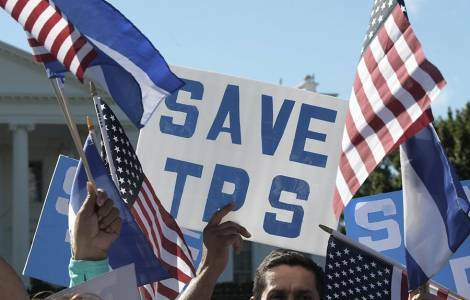 He also urged "to ask the US administration for an extension of the TPS and to address the elected leaders of the Congress to ask them to support a legislative solution for TPS beneficiaries who have been living in the United States for many years" (see Fides 18/10/2017).